"You don't believe me, do you?" I said. He shook his head. 'That you've been asked to go on an expedition to the North Pole?" he snorted. 'No, Beaky, not really." Oh my goodness! I can't remember the last time I laughed so much at a book. Seriously gut-busting, classic Hutchison humour. I know Barry Hutchison is amazing as scary books too, but his comical stories are always my favourite. I love his sense of humour. It's the type of book, that you could read a second time and still laugh in all the same places. I adore Beaky Malone and his family already. They are your typical family, yet they are bursting with humour. And Beaky definitely takes the spot as my No 1 funniest character from now on. He's hilarious when he's lying and he's side splitting when he's telling the truth. With a touch of Jim Carrey's Liar Liar and a smidgeon of Tom Hank's Big, this book is uproarious! Katie Abey's illustrations really capture Barry Hutchison's humour. She draws the pictures the way I would imagine Barry seeing them. Reluctant readers will love this book. 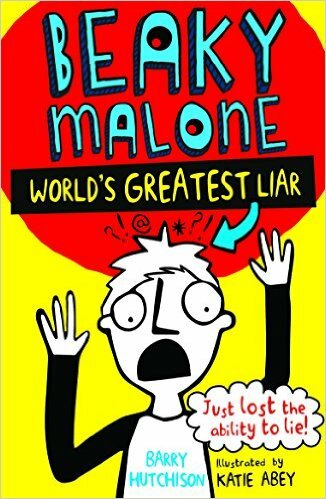 Kids will be desperate for more Beaky Malone,when they finish reading it and I will be pushing them all out of the way so I can get the next book first! If you're looking for a rib tickling read, then this is the book for you.